Draft script for a Christmas talk involving 30 separate items of fruit and veg. If you have any other suggestions or suggested edits then please pop them in the comments, this is a work in progress! But Christmas really is good for you. So here’s a healthy Christmas message. Mary was a bit worried – well you would be - but the angel said Peas be with you. God has chosen you, you’re to have a child, the promised saviour. God is coming to find you. Cool as a cucumber, Mary said ‘yes’ to God’s will, because she trusted God. Now Mary was engaged to Joseph, and God had bean speaking to him too. In a dream he was told that this child was Gods, and that he was to look after Mary and the baby. Soon after, everyone had to go to their home town to pay a tax. Joseph wasn’t very wealthy, he didn’t have a big celery, but the pear of them set off for Bethlehem. A journey of 80 miles or so. They didn’t avocado (have a car though), maybe not even a donkey – the bible doesn’t mention one. So just imagine on foot, Mary pregnant, walking at 1 melon hour, maybe two. A long, tough journey, it took plenty of thyme to get there. They got to Bethlehem, but it was full. It was a really bad time to turnip. Sorry mush, room at the inn is all taken. People used to keep their animals indoors in winter, in a section of the house, so maybe instead of staying in a guestroom, the innkeeper actually had Mary and Joseph into his own home. And there Jesus was born, and placed in a feeding trough, with animals around him, some sat, suma asleep. They were too poor to have a blanket, so they wrapped Jesus in strips of cloth to stop him getting chilli. The Bible also tells of Sages from the East, who followed signs in the sky to find a newborn king, bringing herbs and spices. They first came to the king in Jerusalem, Herod, who was a bit of a bad apple. Herod had a complete ban on another person taking over from him. When Herod heard of the newborn king, he had a bad case of sour grapes, and turned orange, or maybe peach, or even radish (reddish) with rage. Go and find him, then come back and tell me where he is. The wise men weren’t called wise men for nothing. They went straight to see Jesus to offer their gifts: incense, myrrh, 24 carrot gold – gifts to Jesus for a true king. But they didn’t want the news to Leek out back to Herod, so they took another route home. Mary, Joseph, shepherds, innkeeper, kings, wise men. But the main person in this story is Jesus. However you slice it, at the core of all this, is God in human skin, a segment of heaven come down to earth, God’s appeal to everyone, Whether you’re a kiwi, a mandarin or made in Britain, Jesus was born for you. Jesus pips every other Christmas present going. Jesus loves me from my head to-ma-toes, and he loves you too. The only person who comes out of this story the same as they went in is Herod: he is angry, violent, proud and scary before Jesus is born, and he’s angry, violent, proud and scary after. Everyone else is changed – Mary, Joseph, the shepherds, the wise men. God even changes, becoming one of us, becoming human, to sow a seed of new life into your heart and mine. God made us to bear fruit, not to be a vegetable. We can be a couch potato, taking life in like we take in all the presents and the food and the tinsel and everything else, but never changing, never growing, never going deeper into love and joy and why we’re here. Or we can let this Christmas, this child, this God, sows a seed in my heart that will bear fruit. So make Jesus one of your 5 a day, every day, and have a happy, healthy and joyful Christmas. 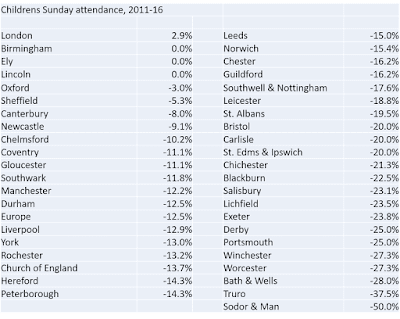 The latest Church of England attendance figures are out, and full marks to the CofE for producing them in Excel format as well as the usual pdfs. So much easier to play about with. The good news, however, ends there. You can always tell if it's been an iffy year, because the press release accompanying the stats is on something other than whats happening in a normal church on a normal Sunday. This year it's the social media profile. 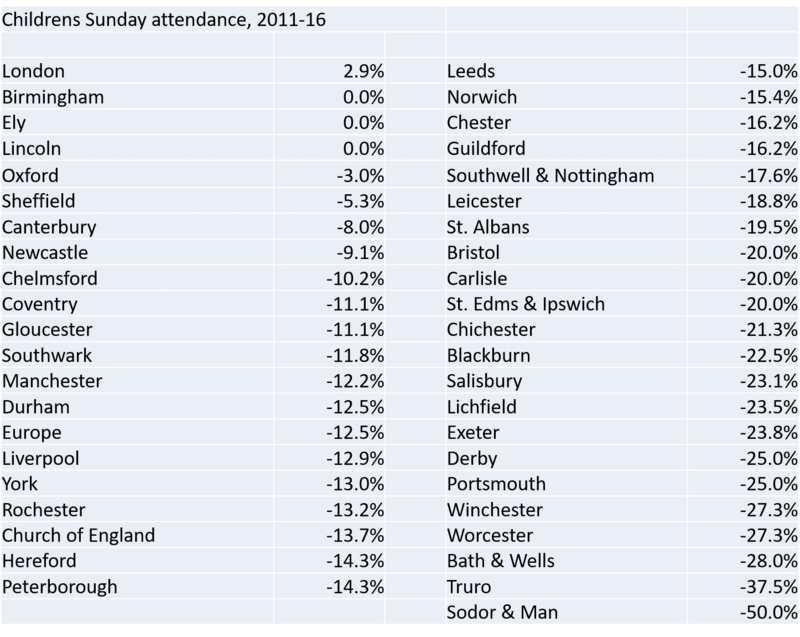 In the last 5 years, only two dioceses have seen adult Sunday attendance grow - London continues to be the engine room of the CofE, but many of the Dioceses that were doing well last time round have seen a sharp drop in numbers. For numbers, read people (see Acts in the New Testament, does it all the time). The rate of decline across the CofE has increased, and to have 12 dioceses recording losses in double figures compares with 5 for 2009-14. Maybe the next generation will save us? Maybe not. Again, London is growing, again, nobody else is, and the figures towards the bottom of the table are catastrophic. Perhaps the hope lies in non-Sunday worship? After all, millions of people now work on a Sunday, and the competition with leisure activities etc. is intense. 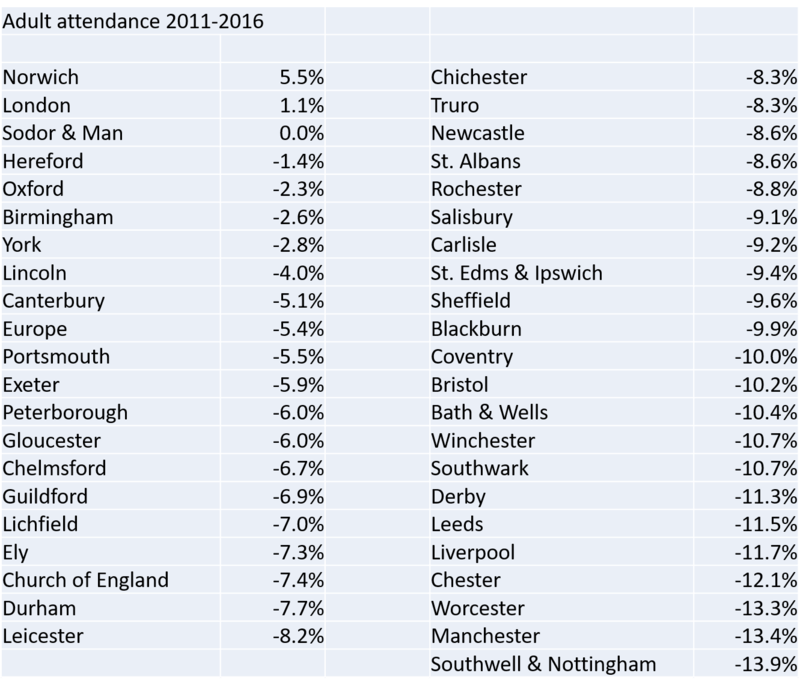 Adult attendance Mon-Sat has risen from 112,000 to 122,000, so it is both growing, and a higher proportion of overall CofE attendance. However childrens midweek attendance has dropped like a stone - I'm hoping that's to do with a different recording system, but fear that it might not be. There is wider cultural change too, away from Christendom and the culture that supported an established church. Baptisms, weddings and funerals taken by the CofE have dropped by 15, 21 and 28% respectively in the last 10 years. This in turn reduces the pool of community contacts and means local churches have to work harder to engage with the community, and move beyond dependence on the 'occasional offices' as a way of connecting with people. One glimmer of hope in the figures is on p10 of the full report. Churches were asked to report on 'joiners' and 'leavers' during the year, and 80,000 people were reported as joining CofE churches. 32% of the adults and 58% of the children had never been church members before. That's encouraging, or does it just mean that we notice more when people join than when they leave? There is probably a lot more to say in the detail, but I hope these stats are actually used for mission - I blogged on a previous occasion how the only people who paid any attention to membership figures were the finance department. A vicar who's seen their attendance drop by 15% in a year is more likely to get a call questioning whether they've under-reported to save on parish share (contributions to the Diocese) than whether they are ok and if they need any support. Many Dioceses now have a mission strategy, including even Bath and Wells (I know, it's hard to believe at times), and it looks like we need it more than ever. But it shouldn't be a preservation strategy, even though God has probably used the ghastly stats above to kick the recalcitrant CofE out of its sniffiness about evangelism. We now need to get over our complacency about prayer. Update: final thoughts - the 4,000 smallest churches have an average weekly attendance of 12, i.e. small enough to fit into a decent size front room. On average, CofE churches have a worshipping community of 75, with 54 of those present on any normal Sunday. This means that on a normal Sunday 1/3 of the congregation is absent. How does a church work and thrive and grow in relationships with this dynamic? Also, each vicar costs roughly twice the average salary (due to housing, training, pension costs), so 40 people giving the 'Anglican tithe' of 5% to their church could support one. Bump that up to 50 for other central costs (our Diocese has over 50 support staff, sorting out things like training, finance, safeguarding, schools). Then you've got to find money to run the church - resources, building costs, etc. If some of those church members are fairly new, it's not long before you get to the point that the average local church only works if it's overseen by a part-time vicar. Either that or it loses the building (the other major cost centre). We have roughly 7,000 vicars to 16,000 churches, so it has to be that way anyway. Despite no longer being able to sustain the '1 parish 1 vicar' model, CofE structures and expectations are still largely based on it. We're like a fat man after a successful diet still trying to wear the same clothes. Buildings, parish boundaries, the expectation (indeed the law of the land) of weekly communion, committee structures, recognition of lay ministry (Lay Readers are the main accredited role alongside clergy, following 2 years theological training, Deacons get lip service and little more) etc.remain largely untouched from 20, 50, 100 years ago. And every few years, your parish gets blessed with an enforced vacancy, just to stifle any growth you might have managed to muster. Either the system will collapse under its own wait (scroll up - maybe we're witnessing that already), or we need a decisive shift away from ancient buildings, paid clergy, or an over-clericalised theology and practice of church that stifles lay leadership. Or there'll be a miracle. I'd argue we need both. update: a few more links at Thinking Anglicans. PS if you're sharing this on Facebook, please could you tag me in, would be good to see the debate on FB as well as on the blogs. update 2: At over 7000 views this is now the third-most read post on this blog (out of nearly 2600 posts). 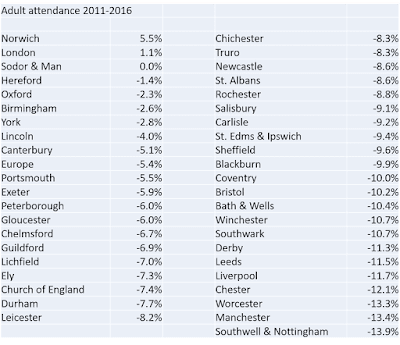 That is already more than the average Adult attendance in 2 Dioceses (Sodor and Man and, ironically, Hereford), and also exceeds the number of men confirmed in the CofE last year (6581). As a sign of the times, Facebook is the source for nearly 2/3 of the visits here, comfortably outstripping Twitter and other blogs. 9.50pm make that 9500 views, why so many visitors? Update 3 Jeremy Marshall has some very perceptive analysis on his blog, worth a read if you are more interested in how we respond to all this. This morning the Prime Minister was due to announce the launch of Election Snap, a new card game from the Conservative party. Should have gone to Specsavers. It is one of a growing range of games from the Teresa May Card School, many invented in the quiet hours of her childhood in a vicarage, waiting for her dad to finish writing another sermon. Election Snap: a riotous game for all the family. Can you tell the difference between one middle aged, middle class, white privately educated male with no career outside politics and another? Neither can the electorate. Bridge (Burning): which political leader can be quickest to resign at the first hint of bad electoral news? Usually won by Nigel Farage, Jeremy Corbyn is struggling to understand the rules. Patience: available in several different versions. The Libdem version takes about 100 years to play out, and even then it turns out to help the other players more than you. Solitaire: Also known as Michael Gove's political career. Go Fish: Robust UKIP response to any question raised in the EU parliament about quotas. Texas Hold 'Em: mass penitentiary on the Mexican border for illegals. Special editions: the Conservative pack comes with 2 knaves, the Jack of Goves and the Jack of Johnsons. The Libdem pack will deal with anyone, and the Labour pack is red throughout but with no Aces and is hard to reshuffle. "I remembered reading the account of a spiritual seeker who interrupted a busy life to spend a few days in a monastery. 'I hope your stay is a blessed one' said the monk who showed the visitor to his cell. 'If you need anything, let us know and we'll teach you how to live without it.' "
Like any dutiful parent of a Lego-mad son, the fixed point in school half term week was the Lego Batman Movie. Less frenetic than the Lego Movie, and following a more conventional storyline, it was fun and occasionally inspired without being spectacularly brilliant. In the movie Batman is prickly, anti-social, and doesn't want or like company, yet keeps a DVD library of romcoms and relationship movies. The 'redemption' of Batman is his discovery of his need of others - his 'family' of Robin, Batgirl and Alfred, and even his need for arch-enemy Joker. Have we heard this somewhere before? Maybe in Ice Age, where the 3 misfits find their place in their new 'herd' of sloth, tiger and mammoth. Maybe in The Incredibles, where Mr Incredible discovers that 'I work alone' doesn't work. Maybe in Harry Potter, where Harry is repeatedly reminded by his friends (especially towards the end of the saga) that he can't do this all on his own and is stupid to try. Maybe in the annoying 'Everything is Awesome' theme song from the first Lego movie - 'everything is awesome when you're part of the team.' Or dig back to 'About a Boy', the Hugh Grant movie where Grants character is just as averse to company as Batman, but discovers along with the Boy, that 'we all need backup'. What is it about this story that we repeatedly tell it to ourselves, and repeatedly hear it and find that it has traction? Our society is individualistic, dependence and commitment don't come naturally, and aren't encouraged. And in the place of the old gods, discovering a new-found 'family' is the nearest thing we can offer to a spiritual experience of communal identity and belonging. Maybe its an indicator of the failure of the church to provide genuine community, where people can belong, find purpose, acceptance and love. It may be Robin who is formally adopted (sort of) but Batman is an orphan too, and just as much in need of family, perhaps more so, than Robin. The Bible speaks of adoption into a family where we are loved, where we belong, where we find our place in the team of the master builder. A consumer society is by nature transient, material things are given too much significance and relationships too little. The hunger for belonging reflects that primal part of our design: 'it is not good for the man to be alone'. It is the persistence of his friends which finally wears Batmans resistance down, and saves him in the process. Persist in loving, welcoming, accepting, there may be a Batman out there who needs you. over the next few days we will be mostly doing this. Prayers appreciated, if you're that way inclined. CS Lewis experience in his grief still strikes a chord. Today is 'Time to Talk' day. If you know someone who's struggling, message them and say hi. If you know someone who you suspect is struggling, but has never actually said so, message them too. So many people with mental illness fear what others will say if they admit to it. That's part of what the illness does to you. It's a hard thing to open up about mental illness, lets make it as easy as possible.